This module is used to organise all the estates, buildings, floors and their associated drawings that have been uploaded to Accordant. The Estate Manager can be accessed from the Accordant9 home-page. It can be located at the Installed Modules section. On opening the module, the first page, by default is Buildings. At this tab, all estates that exist in the system are enlisted. If new estates are required, an administrator must add these. There are two ways to navigate through the buildings tab. Use the Locator bar to navigate the estates, buildings and floors using the drop down menus. An alternate way is to double click on the name of an estate or building to navigate to it. Buildings gives a quick overview of the space allocation relating to a particular estate/building/floor and is categorized as Charged (chargeable space), Shared (shared space), Net Space (combination of charged and shared), NCS (non-chargeable space) and Total (combination of Net Space & NCS). Code: This shows the short code assigned to the building, a flag indicates the country in which the building is in. Name: The name of the building. Dept Code: If applicable, the department which owns the building is listed here. Address: The address of the building. Flrs: The total number of floors in the building. Charged: The aggregate space in the building that is categorized as chargeable to the business. Shared: Space that is shared among the different departments. Net Space: The sum of Charged and Shared space. Total: Total area of the building. The building information can be edited by clicking on the building code; this brings up a pop-up window called 'edit building', where the changes can be committed. Once the changes are complete, click on “save”. The addresses can be edited in an identical manner. Once a building is selected, the floor list shows all the floors of the building whose floor plans have been stored in the system. The columns listed are the same as in the view for buildings and estates however, some additional information is also listed. Locsys: Location System used on the floor. O/L: Offline – This removes a plan from view in the system, it can be used to hide a floor if it is not being used. Vac: Vacant – This is used to insinuate that no one will be sitting at any of the locations on this floor. Rooms: The number of rooms on this floor. DWG: The number of DWG files that are associated with this floor. The useable space of the floor is further categorised in the same manner as the space for a building as a whole. This section of the Estate Manager module shows the types and sizes of rooms and provides further information about locations on the floors. Selection of a building and floor can be done using the locator bar at the top of the page, just like in other modules. Once a floor is selected, the floor plan is displayed in the default view mode of Measured Areas. There is a key in the top left of the screen detailing what the floor plan shows. The building edge, rooms, non-chargeable area and circulation are defined in the CAD program when the drawing is uploaded to the system. This is done by creating closed areas using polylines on specific layers, the system recognises these lines and creates the representation shown on the web. The areas that are inside the building where no enclosed rooms are drawn, are given the label "Remaining Chargeable Open Plan Space". The floor plans can be viewed in different ways via the drop-down menu selection; View Mode. Descriptions of what the different views show are explained in the following links below. Space balance is used to generate a list of divisions and the space that they use on each floor of a building. The screen is split into two sections – the top displays the estates, buildings and floors where the data will be gathered from and the bottom showing how the floors are split among different divisions. To run the space balance on a specific area, use the locator bar to select it, then click "Run Balance". Depending on the size of the area selected, it could take a minute to run the request. The results are then displayed in the main area of the page beneath the overall information regarding the floors that the balance is run for. Divn: The division that has space allocated on the selected floor. Dept: Any specific departments allocated space. Assigned: The space assigned to the division. Flr. (u/l): Floor Uplift, the shared space on the floor assigned to the division. Bldg. (u/l): Building Uplift, the shared space in the building assigned to the division. Est. (u/l): Estate Uplift, the shared space in the estate assigned to the division. Uplift: The combined uplift assigned to the division. Total: The aggregate area of Assigned and Uplift. 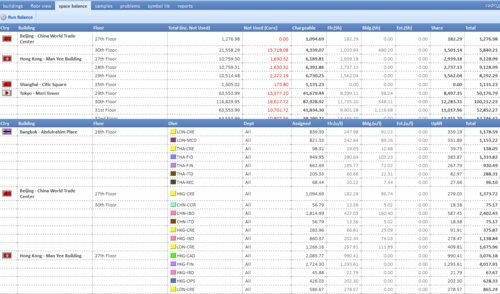 Samples allows a user to view how different departments change their space usage throughout a specified amount of time. A sample will only be displayed if there is data for the years selected. Clicking Create Sample allows a user to upload information for the samples to be created. By ticking Show Total, total information for each building is displayed, clicking Show Grand Total will give a total for the entire sample. This page is used to find discrepancies between space that is chargeable and that which has been allocated to a department. To view the data, select the area to view using the Locator bar, then use the “View” drop down menu to specify the exact information. Any problem will be highlighted in red. These will need to be fixed so that correct reports can be generated. 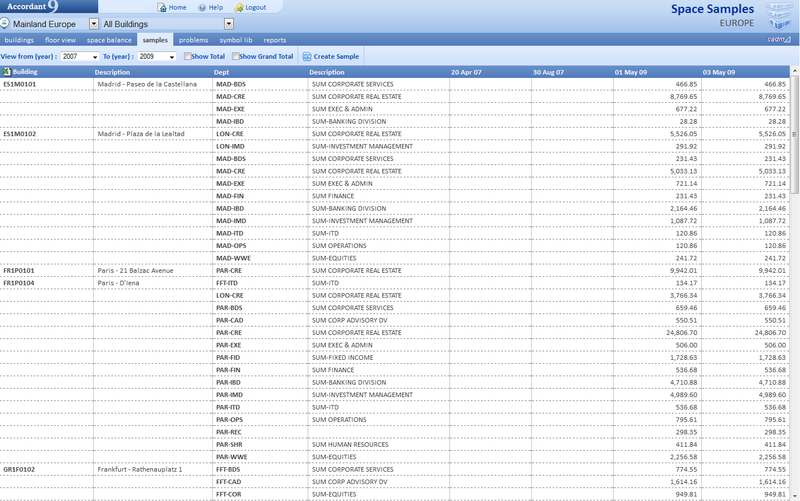 The Symbol Library lists all the blocks that have been used in the CAD drawings that have been uploaded to Accordant. The blocks displayed are being managed by Accordant so that their location is tracked and data can be transferred between the block attributes and the web system. In this section the library can be searched, and changes can be made to the properties. Double clicking on a specific symbol brings up the above pop-up allowing editing of the specific symbol. To the left of the main area are different search and sort tools, including useage and groups. These can be used to find specific symbols for viewing and editing. 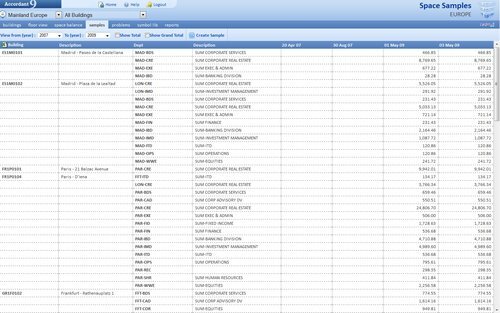 Reports can be generated detailing the locations in the system and the allocated space. They are generated in a similar manner to reports for moves. First select the estate, building and floor using the locator bar, then select the report to be generated using the drop-down menu. Click “Make PDF” to create the report. Once a report has been created, it can be viewed by clicking its name. The size and the creation date of the report on are listed next to it.